Kingpin: I have a proposition for you, Loki. Loki: Please. You look like a mountain of mashed potatoes. Kingpin: A business proposition. I'd like you to be my lawyer in the case against Nick Fury. Loki: Do you realize that I'm genetically and morally opposed to truth and justice? Kingpin: Do you know anything about Midgardian lawyers? I think you may find it to your liking. Loki: What's in it for Loki? 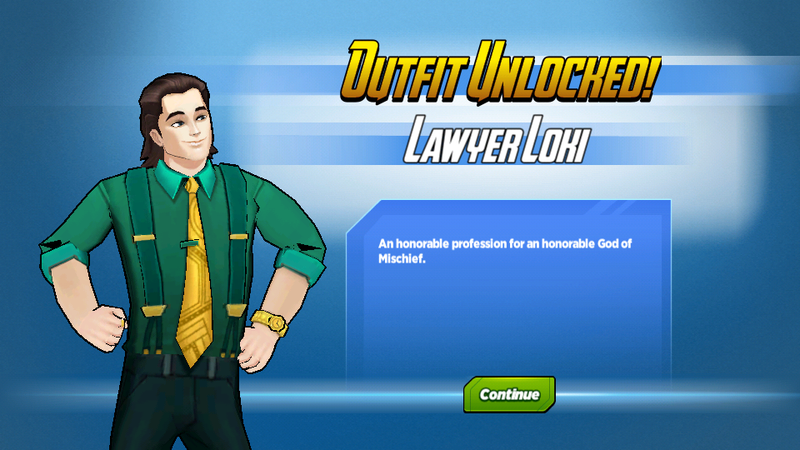 Get the Lawyer Loki outfit! Daredevil: I hate to say it, but you do look like a lawyer. Lawyer Loki: Even a blind man knows true majesty when he sees it. Prepare to be humiliated in the court of law and public opinion. Daredevil: Do you even know anything about the law? Lawyer Loki: I know that the essential ingredient for success as a prosecuting attorney is the ability to manipulate the jury and the accused. Loki is the greatest manipulator to ever exist. Lawyer Loki: I see what you did there. Nice lawyering. Kingpin: Have you developed a strategy for forcing Fury to resign? Lawyer Loki: I'll start by destroying his reputation. Kingpin: Good. Keep me updated. Lawyer Loki: I'm not your secretary, King Potato. If you want to know what Loki is doing, you can stare in awe like the rest of peasants. Pepper Potts: No one will believe that was Director Fury. Lawyer Loki: People believe what they want to believe. They've seen him abuse his power, so they're eager for him to fall from grace. Pepper Potts: Abuse his power? Director Fury only keeps secrets to protect us, and the rest of the world. He only disciplines students because you guys are always messing around, and blatantly ignoring the rules. Lawyer Loki: He's lied from the beginning. It's finally time to uncover his secrets, and take control of Avengers Academy. Lawyer Loki: Would a great leader really make such a questionable decision? Lawyer Loki: I need your assistance to gather evidence on Fury and expose his secrets while I skim Midgardian law texts in anticipation of this absurd trial. Lawyer Loki: I'm surprised you're so easily convinced. Black Widow: You just described exactly what I've been doing since the second I got here. Lawyer Loki: I rarely pay attention to anyone but myself. Daredevil: How do you like the future law offices of Nelson and Murdock? We aren't quite done with law school, but the deal on the space was too good to pass up. Lawyer Loki: I can see why. It's drab, depressing, and faintly smells of mouse breath. Lawyer Loki: I understand. Lawyering is your means of escaping a sad existence of poverty and rodent odor to enter a life of wealth and power. Daredevil: Not really. We just want to help people. We might never make that much money. Lawyer Loki: I haven't been a lawyer for very long, but I'm fairly certain you're doing it wrong. Lawyer Loki: My outfit is impeccable, my knowledge of Midgardian law is unparalleled, and your fate is sealed. Would you like to resign now, or do we actually need to go through with this charade? 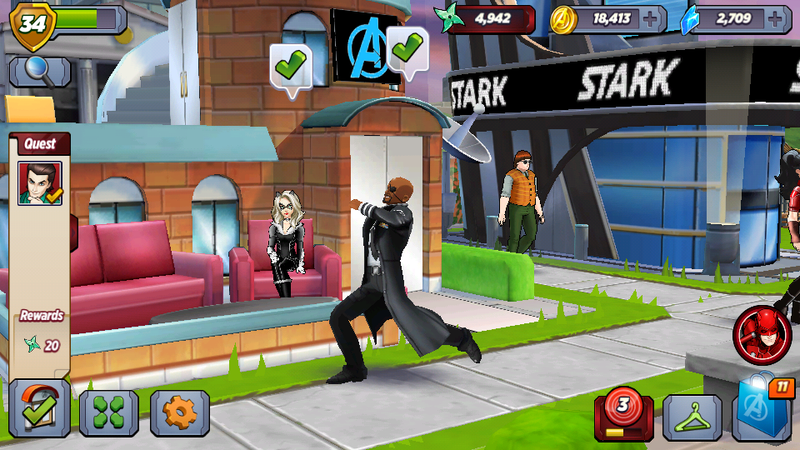 Nick Fury: I'm actually looking forward to this. Daredevil: The gesturing was entertaining. The actual lawyering was awful. And I appreciate your tie clip. I'll give you a 5.5. Lawyer Loki: You honestly believe you can defeat me in the court of law? Or anywhere else for that matter? Lawyer Loki: I appreciate your confidence, Blind-Man. I'm looking forward to crushing it under my gilded loafers, and sending you back to your sad little roach-infested office that never was. Daredevil: I guess I'll see you in court. Lawyer Loki: I suppose you will. Daredevil: You can have the last word, Loki. I'll take the win. Lawyer Loki: Can you not see these golden shoes?! Loki is obviously winning! 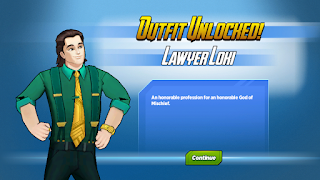 What do you think of Lawyer Loki? Were you able to get him? Have a favourite action?